Bernie Sanders' signature issues aren't "white" issues. I’ll set aside the fact that the NAACP and the NHLA (the national Latino coalition) have both given Sanders 100 percent voting scores in every Congress of his Senate career — unlike Hillary Clinton. Or that Sanders spent the sixties in Chicago getting arrested as a SNCC organizer while a few miles away, in the suburbs, Hillary Clinton was doing her part as a “Goldwater Girl” with the Young Republicans at Maine East High School. Sanders’s main offense, it seems, isn’t anything he’s failed to do or say. Rather, it’s his insistence on spending so much time talking about issues that are apparently irrelevant to the lives of black people or immigrants: jobs, wages, health care, college tuition, and the like. He drones on about poverty. He has never written a Beyoncé think-piece. It’s time for Sanders to reassess his priorities. To help him out, I decided to gather some information on the matter. Not being an MSNBC pundit or a Salon contributor, I can’t claim to have unique insight into what people of color in this country really care about. But I did find some data from Gallup that might shed some light. Gallup regularly asks people the following question: “What do you think is the most important problem facing this country today?” The respondent volunteers up to three answers, and the interviewer records the responses word-for-word. Then, the data wizards at Gallup group together all the basically similar answers under a single heading (such as “Ethical-Moral-Religious Decline”) and count the results. The most recent Gallup poll asking question was conducted on March 5–8, 2015. There were 203 respondents who said they were something other than non-Hispanic whites. Of these, 105 were non-Hispanic blacks and 61 were Hispanic, the rest being Asian or something else. What follows is the number of respondents of color who volunteered each issue as their first answer. In first place, by a pretty wide margin, we have “Unemployment/Jobs” (24 respondents). Then “Politicians” (17 respondents). In third place we have what Gallup called “The Economy (General)” (17 respondents). After that comes “Immigration/Illegal Aliens” (12 respondents, 5 of whom were non-Hispanic blacks; the number of Latinos was not specifically recorded). And in fifth place we’ve got “Health Care/Hospitals” (10 respondents). There are three other noteworthy items: (1) “Race Relations,” as Gallup terms it, was the most important issue for 6 respondents; (2) The criminal justice system was most important for 5 respondents; and (3) elections or election reform was most important for 3 respondents. As you might imagine, with such an open-ended question the total number of distinct answers was large — 34 in total, as recorded by Gallup. So to help make sense of them all, I’m going to consolidate them into 10 larger categories of my own design, ordered from biggest to smallest. These are raw numbers, not percentages. The sample size is almost an even 200, so to get a percentage, just halve each number. Behold: the Vox populi. 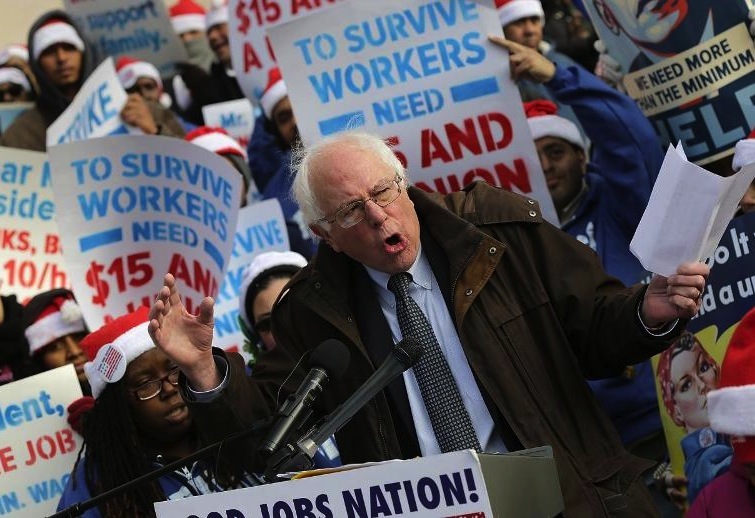 My message to Bernie Sanders is simple: listen to the people! Bernie Sanders’ signature issues aren’t “white” issues.